Is There Any Hope for Agreement at Copenhagen? The smoke stacks at American Electric Power's Mountaineer coal power plant in New Haven, West Virginia. Now, global climate-change negotiations appear headed toward the same aimless end. World governments will convene at COP15, the U.N. climate-change summit in Copenhagen, next month  a self-imposed deadline for producing a successor to the expiring Kyoto Protocol. But as diplomats in Barcelona today concluded the last round of official U.N. talks before the summit, it's becoming clear that any agreement between developed and developing countries on greenhouse-gas-emissions limits will be next to impossible by December. "I don't think we can get a legally binding agreement by Copenhagen," admitted Yvo de Boer, the head of the United Nations Framework Convention on Climate Change (UNFCCC), on Bloomberg Television. In a hopeful note, de Boer added that Copenhagen could still prove a "turning point" in the campaign against climate change and that a successfully conveyed political message at the summit could translate into hard targets by 2010. For environmentalists, though, that kind of "progress" would represent a significant comedown from just a year ago, when the election of President Barack Obama electrified greens worldwide. And judging from the week of recriminations at Barcelona  negotiations were marred by a temporary walkout by African nations as well as inaction by the U.S.  even 2010 seems like an optimistic deadline for global agreement. "The talks in Barcelona saw drama but not enough progress," said Alden Meyer, director of strategy and policy at the Union of Concerned Scientists. "Uncertainty about what the United States can bring to the Copenhagen summit hangs over these negotiations." That uncertainty comes courtesy of the U.S. Senate, which is still locked in debate over carbon cap-and-trade legislation. 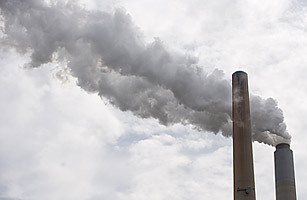 (The House has already approved a bill that would cap U.S. greenhouse-gas emissions.) Democrats on the Senate's Environment and Public Works Committee managed to shove carbon-cap legislation through their panel this week, over the objections of Republicans, but the bill is still a long way from becoming law. And without guidance from the Senate, President Obama has been reluctant to signal on the international stage just how big a cut in U.S. emissions he is willing to accept. "A number from the President of the United States would have huge weight," said de Boer  but no number is forthcoming. With the U.S. unwilling to stake out a position, developing nations say talks are pointless. In Barcelona, 50 African nations walked out of negotiations, protesting the fact that rich nations refuse to cut their emissions at least 40% below 1990 levels by 2020  the most aggressive figure suggested by the Intergovernmental Panel on Climate Change. The E.U. has pledged a 20% cut by 2020 (30% if other nations make similar promises), but the pending U.S. legislation would reduce emissions only 4% below 1990 levels by 2020. Key to any global deal are India and China, major developing nations whose national emissions are ballooning. But they are waiting on the U.S., which in turn argues that India and China need to act early too. It's a standoff that dates back to the era of former President George W. Bush and, despite Obama's green rhetoric, continues to stymie talks today. Activists accuse other developed nations, including those in the E.U., of also backing away from tough emissions cuts while casting blame on fast-growing developing nations for not doing their part. "Rich countries are clearly using the U.S. as an excuse to put their national interests above alleviating the suffering of those millions of people killed, bereaved, made hungry or made homeless by climate change," said Antonio Hill, climate adviser for Oxfam. "Why would poor nations sign up to a climate deal that is all empty promises?" Those aren't the only points of contention. There are debates over how much climate aid to provide developing countries as they adapt to global warming. The E.U. estimates that $150 billion a year will be needed by 2020, but it's not clear that the U.S. agrees with a figure that large, or which countries would contribute what portion of the total. There's dissent as well over deforestation, the impact of which one new study suggests may be overestimated; the paper finds that the loss of trees accounts for only about 15% of global greenhouse-gas emissions, down from the previous estimate of 20%. Still, this is an issue that could be successfully addressed at Copenhagen  through a plan called Reduced Emissions from Deforestation and Degradation (REDD)  but even here, some environmentalists complain that the current talks underemphasize the importance of protecting existing forests. "With no provisions to monitor how countries are implementing REDD and applying safeguards, the REDD agreement is worth no more than the paper it is written on," said Rosalind Reeve of the NGO Global Witness. As the UNFCCC's de Boer said, however, Copenhagen could still turn out to be a political triumph. At least 40 world leaders, including British Prime Minister Gordon Brown, are expected to attend the summit, and a strong political agreement could set the stage for a technical one down the road. "What we will need after Copenhagen is a little time," said de Boer. The danger, of course, is that missing the first deadline only opens the door for an endless line of successively blown targets. Just ask the poor souls of the WTO. Read about getting air traffic under control. See why Russia is dragging its feet on climate change.